The 1974 "Battle of the Bulk"
In 1974, Dave Cline went to work for the United States Postal Service at their New Jersey Bulk and Foreign Mail Center in Jersey City, New Jersey, right across the river from NYC. The Bulk, as it was called, was not your mythical sleepy neighborhood post office with a single postal employee slowly sorting the mail. The Bulk was the first of twenty-one bulk mail centers, which were going to be the linchpins in a plan to quickly and aggressively transform the old sluggish United States Post Office into the United States Postal Service (USPS), an industrial giant. The BMCs were created and placed outside the major urban centers to churn out the mail like the auto plants of Detroit made cars or the steel mills of Chicago-Gary turned out steel ingots. They were massive industrial factories filled with machinery and thousands of USPS workers where automation, massive use of new mail-sorting machinery and modern corporate methods became the order of the day. Workers protested the speedup, sub-standard safety conditions, and draconian repressive management measures that accompanied the creation of the BMC. The USPS saw increased profits and efficiency in its new facilities and new corporate management structure, while postal workers saw increased degradation and misery. That is one thing about returning soldiers, they expect better. That was one of the driving forces of our movement. We had a lot of ‘Namies. Dave Cline became one of the leaders of the rank-and file insurgency at the Bulk. He joined Outlaw, an “anti-imperialist organization of postal workers” which had active members in USPS facilities throughout the New York City metro area. 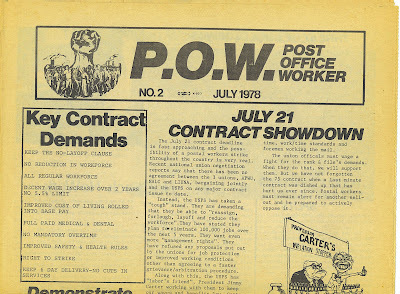 Outlaw emerged from the aftermath of nine-day 1970 postal strike where 173,000 workers successfully defied no-strike laws aimed at federal employees. The militancy of the 1970 strike was centered in New York City. Dave was one of the leaders of a successful 4-day “job action” in 1974 at the Bulk protesting the USPS arbitrary changing of work schedules. Dave was a union steward of the American Postal Workers Union (APWU), but also a big critic of the APWU’s leadership. Union leadership in the United States at this time, especially on the national level, was complacent, often more interested in collaboration with management than fighting for worker’s rights, and treacherous at times in foiling attempts by the rank and file to organize itself. The APWU was no different; Outlaw, with Dave as one of its leaders, was often locked in battle with Moe Biller, the president of the Metro local which represented all APWU members in the New York City area. Pitched battles, with chairs flying, erupted at union meetings, as Outlaw brought hundreds of Bulk workers to fight against the undemocratic methods of Biller and his cronies. Dave, Ken Leiner, and P. McClosky were fired in 1976 and this had a chilling effect on the insurgency at the Bulk. However, one and a half years later the National Labor Relations Board (NLRB) ruled that the USPS had acted illegally since they had terminated the three activists for what was deemed “union activity”. 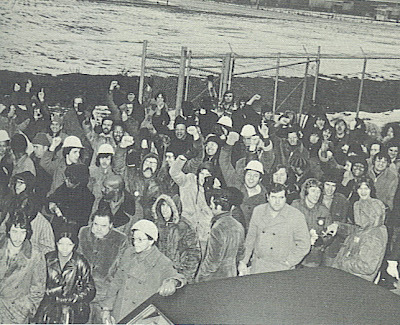 Leiner, Cline and McClosky got their jobs back, back pay, and marched back into the plant in April 1978. “I played it to the hilt, I walked in down the main aisle, with my fists over my head-Rocky style,” remembered Dave. The New York locals of the APWU and the NALC issued calls for two demonstrations in front of the Manhattan GPO on 33rd Street to agitate around the contract in the months before the July 20th contract deadline. The GCC played a major role in building these demonstrations which attracted several thousand postal workers each time. Members of the GCC organized other Bulk workers to go to a July 13th rally in Washington, DC, where 6,000 disgruntled postal workers from around the US marched from the Washington Monument to the new, sleek headquarters of the USPS. “No Contract-No Work” was the most popular chant from the demonstration which postal executives described as the loudest and largest display they could recall. We were thinking about a nation-wide “Vote No” movement on the contract. We did not think strike action was in the picture at all… We thought an anti-contract demonstration could possibly spearhead a significant rank and file opposition, a “Vote No” to the contract. Bulk workers were so angry at the meagerness of the proposed contract and what they saw as their national union leadership’s “sellout” that over ninety percent refused to go to work that morning and for the next four days the Jersey City postal plant was effectively shut down with Dave Cline and the rest of the Good Contract Committee in the leadership. The Bulk Jersey City wildcat strike lasted from July 21-25, 1978 in an attempt to nullify the tentative national contract agreement between the various postal unions and the USPS. The conflict spread till eventually 4,750 postal workers were on strike nationwide. The Richmond, California bulk center was effectively shut down almost as long as the Bulk in Jersey City. There were two or three day walkouts in Washington, D.C. and Philadelphia and sporadic walkouts or protests in Chicago, Allentown, Pennsylvania, Kearny, New Jersey, Miami, and Los Angeles at other bulk mail centers. After the strike was broken, 125 workers were fired, 130 were temporarily suspended, 2,500 received letters of warning, the union memberships did not ratify the proposed settlement, and an arbitrated contract settlement was imposed. The 1978 wildcat strike was the largest strike of federal employees since the massive 1970 walkout of 173,000 postal workers during the creation of the USPS and the institution of federal employee collective bargaining. The 1978 Bulk wildcat strike was not surpassed in size among federal employees until 11,500 members of the Professional Air Traffic Controllers Organization (PATCO) struck in August 1981. Dave Cline was one of the Bulk workers who was fired and never got his job back. A vigorous three year amnesty campaign was successful in restoring many strikers to their jobs, but Dave was one of a few denied reinstatement because of his leadership role in the wildcat. Dave eventually got another job as a toll keeper for the Metropolitan Transit Authority (MTA) where he was an active steward and a valuable member of the bargaining committee of TWU Local 510, which represents Metropolitan Transit Authority (MTA) employees working at the MTA bridge and tunnel tollbooths and the three metro area airports for many years. Dave Cline is a true hero of the working class. We remember him and honor him for his long and outstanding role as a leader in the veterans, labor and anti-war movements. Dave Cline ¡Presente! The quotes from Dave Cline were taken from an interview with him on April 20, 2007. Hey, thanks for this! Hope you don't mind, I added this post to the libcom library (http://libcom.org/history/1978-postal-wildcat). There's a couple other articles on the 1970 strike. Was wondering, do you have any info on the 1974 wildcat? And what's up with the Michael Braun book? Is that out yet?